What is moleskin? It's not made from the skin of moles. It's actually a thick cotton fabric that's been brushed and sanded, creating a slightly fuzzy pile on one side. Think corduroy without the wales. Soft yet durable, it stands up pretty well against bitter, wet and windy days. Which may explain why the majority of manufacturers of moleskin are British mills. The fabric is seemingly everywhere this season, but we can't help noticing all the jackets—from double breasted and peak lapel blazers to hunting-influenced sport coats. Because of its sueded texture, moleskin adds a relaxed, casual air to whatever you pair with it. 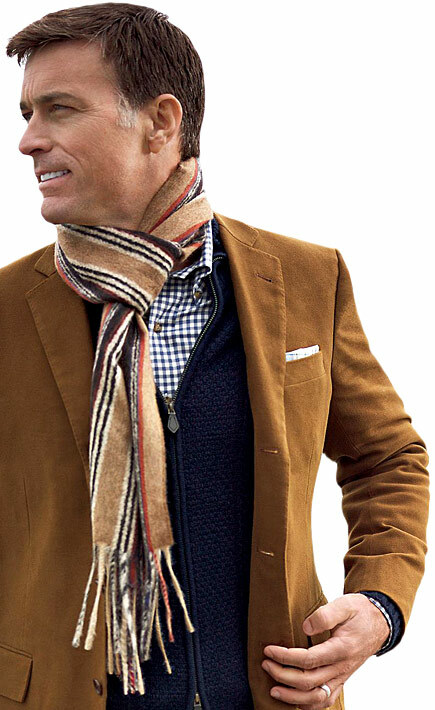 Kind of like a pair of well-worn boots or a plaid shirt—which aren't bad accompaniments to these jackets, actually. Moleskine notebooks are not, in fact, made from moleskin.